Thanks for your response. I do think we are making progress now. In your last message, you confirm that the only evidence supporting your hypothesis is the observed correlation between surface temperature and cloud radiative forcing as well as what you refer to as "decorrelation" of the data. Because of the complexity of the Earth, there are always multiple hypotheses for every correlation. For the observed correlations you note, I have a competing hypothesis which I think explains the data better than yours. Here is mine: the heating the surface is caused by energy stored in the ocean. This drives changes in atmospheric circulation, which change clouds. Clouds play a very small role in the surface energy budget during ENSO. 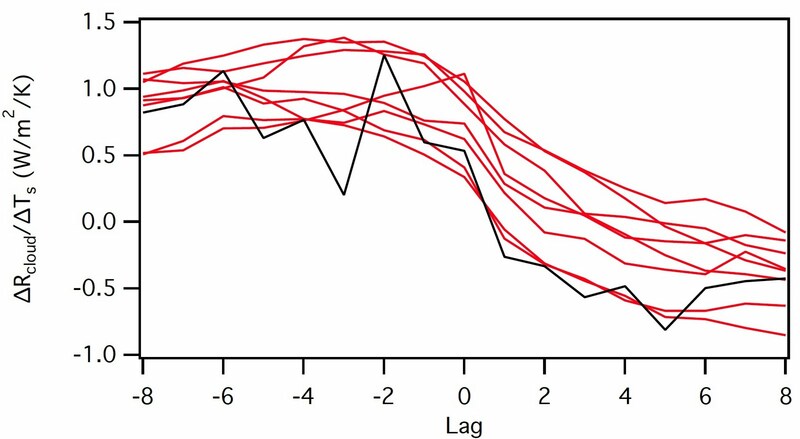 (1) Climate models successfully simulate the same lead/lag relationship -- see my attached figure. 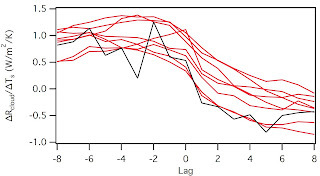 This suggests that correlation you identified is just normal ENSO physics. (2) Energy budgets of the surface also suggest virtually no role for clouds during ENSO (e.g., see Trenberth publications). (3) As far as the decorrelation of the data goes, I have not looked at this in the climate models. However, I think you sent a figure a few e-mails ago showing a climate model that reproduced that. Again, this suggests that it's normal ENSO physics. In addition, I note that the models generate about the same r^2 as the data. Finally, you have no evidence supporting your hypothesis beyond the mere existence of the correlation. Because of that, your theory explains nothing (e.g., you cannot tell me what percentage of all of the variability is due to "forcing" versus "feedback") and makes no testable hypotheses. (a) Do you have any evidence that my proposed hypothesis is wrong? allow it to be falsified? If so, what are they? (c) Does your hypothesis explain anything that my theory does not?